Whether you’re a true bookworm or just love a good yarn, Leeds City Museum has something for you at a free family fun day this half-term, with a helping hand from Ilkley Literature Festival and The Grammar School at Leeds (GSAL). ‘We Love Stories’ is a day of activities devoted to books and stories, the fourth in a series of themed holiday workshops for children run at the museum in partnership with GSAL since October 2012. The events have attracted over 3,000 visitors to the museum and resulted in GSAL being named the Leeds Museums and Galleries’ ‘Partner of the Year’ in Leeds City Council’s Awards for Excellence. Building on this success, ‘We Love Stories’ has lots to offer families looking for half-term fun. Children can enjoy storytelling and illustrating, crafts, face painting and competitions and ‘Spin a silly story’ inside Chol Theatre’s inflatable pod which was one of the attractions for children at Ilkley Literature Festival. Fresh from their 40th anniversary year and another hugely popular Children’s Festival, Ilkley Literature Festival are bringing illustrator and author Stephen Waterhouse to the event to create illustrations with visitors. Children can also take a peek into an imaginary world at the museum’s current exhibition ‘Through the Magic Mirror’. Stepping through the magic mirror children will see the picture book world of author and illustrator Anthony Browne brought to life, and can say hello to favourite characters and stroll through familiar scenes from Anthony’s stories. 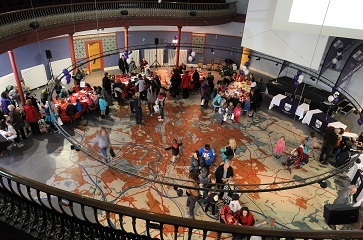 ‘We Love Stories’ takes place at Leeds City Museum between 11.00am and 3.00pm on Friday 1 November. Admission and all activities are free of charge.